When I was a lad, the XMan turned to me and said, "Son, you need to play Mr. Ree. It is the best board game ever created. If you ever find it, get it immediately." That started a 20-year search for Mr. Ree. As a child, whenever I entered a toy store, I frantically searched for the game. Sadly, I never found it in a toy store, and later I learned the game had been out of production since shortly after 1957, its final printing. Dang, as an 11-year-old, I didn't realize that could happen. In theory, the advent of the Internet should have helped me with my quest for Mr. Ree, but unfortunately, I didn't know the proper spelling of "Mr. Ree." 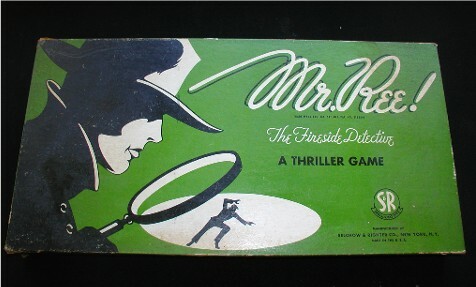 I was convinced it was "Mr. Re" or "Mister Re," and I never found the game online until I discovered a major clue eight years ago. In 2001, the film "The Royal Tenenbaums" came out, and Mr. Ree is among the games in the Tenenbaums' game closet. Mr. Ree is impossible to see in the above photo, but the game with its glorious proper spelling is there. After seeing the proper spelling, that spurred me to eBay, where I bought all of the Mr. Ree games I could find - four. Only one of the four had all of its pieces, and I gave that one to the XMan on a Christmas in the early 2000s. Some people use eBay to purchase junk. I use it to solve crimes. In the past 10 years, I have used eBay three times, including today. One of the times was to purchase Prince's "1999" and "Purple Rain." That was out of the ordinary, though. All of a sudden, I had a feeling that I must have those albums, and, voila, there they were, cheap as can be. Obtaining detective board games is typically how I use eBay, and today, I bought a copy of the British board game "Cluedo." Curiously, I paid for the game in pounds and am unsure if the grand total when translated to American was $20 or $2,000. Cluedo looks like da bomb. It is similar to Clue, but the differences are real cool. Mr. Boddy is not killed, like in the U.S. game. Rather, Dr. Black is murdered. Also, the character Mr. Green is actually Reverend Green in the British version. ... Sweet!